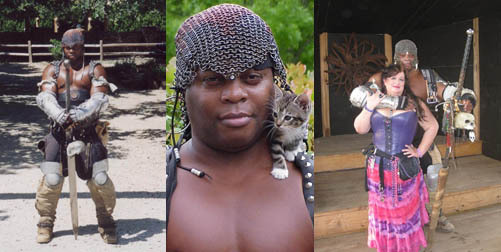 Many of you know Sholo the Nubian (Hilton) from Texas Renaissance Festival, and other renaissance festivals. We’ve seen Sholo at the front gate, throughout the faire, and heard the warrior speak poetic words of war and of love, moving our hearts and our spirits. Those of us who know Hilton know he’s a kind-hearted, gentle man. He has a great laugh, and this world is a better place with him in it. Friday of last week, Hilton had a severe asthma attack that shut down his lungs, putting him in the ICU. It was a close call there for a while. The good news is he’s breathing on his own now and he’s out of ICU. He’s been moved to a regular room and, with healing energy and prayers, will hopefully be out of the hospital soon. This has taken an incredible toll on his family’s finances. Due to health reasons, his wife, Ellen, is unable to work; so their funds are rapidly being depleted while he is in the hospital. A PayPal account has been setup to take donations for the family, to help offset expenses. If you can, any amount donated would help Hilton and Ellen in their time of need.